This adults-only (16+ years) all-inclusive resort is conveniently located in the exclusive Playa Mujeres complex overlooking the cerulean waters of the Caribbean Sea. 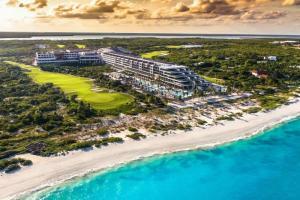 The hotel's design harmonizes with the mesmerizing natural landscape of Playa Mujeres. The hotel's unique focus on contemporary art is reflected in immersive art exhibitions, and in the innovative decor. 431 spacious suites feature wood and marble accents, paired with avant-garde furniture and jaw-dropping views of the golf course and the sea. Your all-inclusive experience includes a multitude of exquisite dining experiences including round-the-clock room service, as well as a wide and innovative selection of premium drinks and cocktails. Immerse yourself in an extensive program of activities included in the price of your stay.